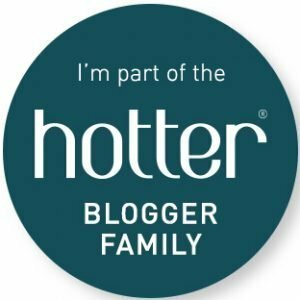 Tigger once said to me as we headed out on a family day out ‘What did you and Daddy do before you had children?‘. I laughed and said that we stayed in all day. 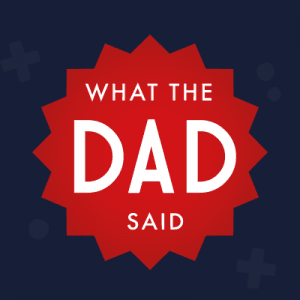 ‘Exactly, you only had children so you could out fun places‘, he replied with his quick wit. 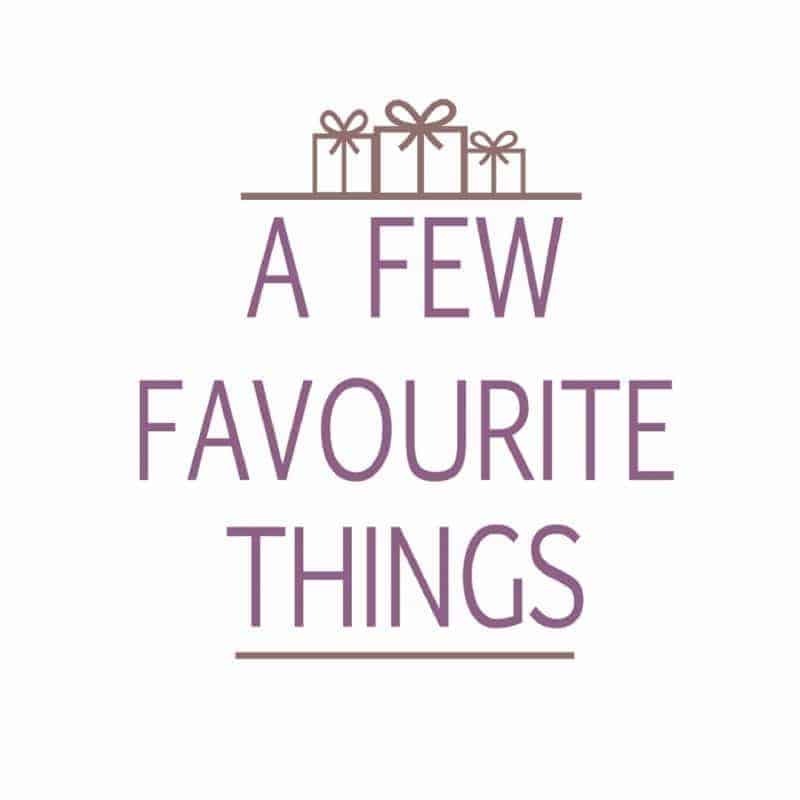 Whilst we didn’t stay home before the children, we are really making the most of having the children and getting to visit some wonderful places. Always on the hunt for our next adventure. 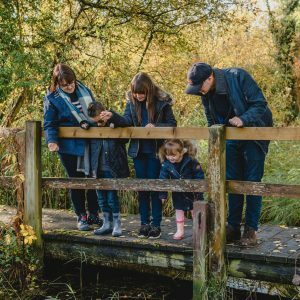 We often visit High Lodge, Thetford to enjoy the woodland walks and the varied trails available. 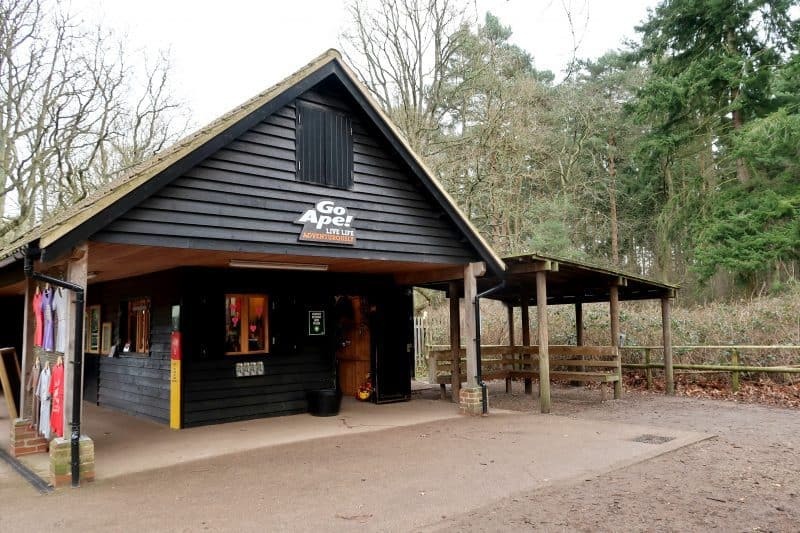 With each visit, Roo looks longingly at the Go Ape Thetford centre, however, has been too short to meet the 140cm height requirement for the Tree Top Adventure. Late last year she finally had a growth spurt and met the height requirement. So we planned to take her to partake in the Tree Top Adventure course during the February half-term holiday. 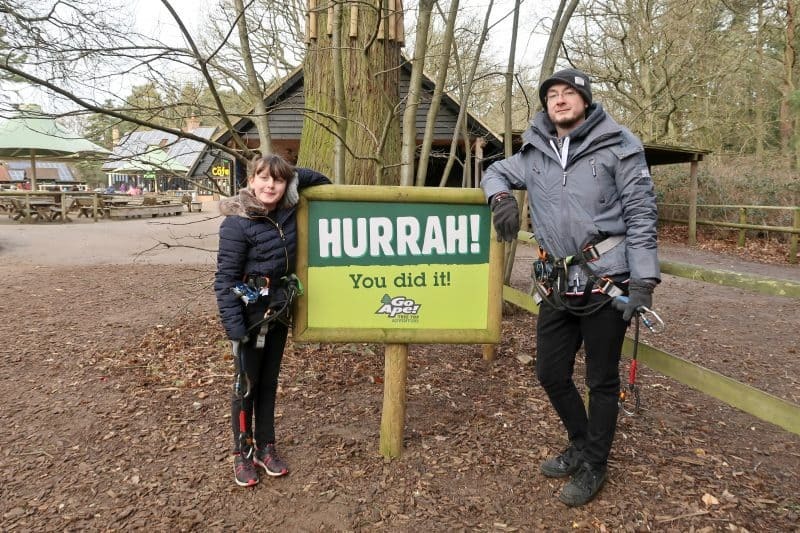 Enjoy two to three hours in the trees taking on Zip Wires, Tarzan Swings, Rope Ladders and a variety of obstacles and crossings – an adventure to test all the family. 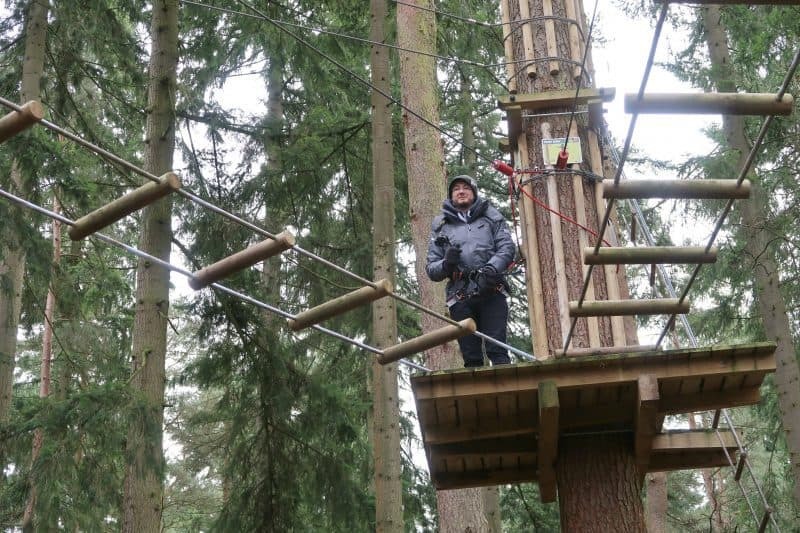 Climb and conquer some of East Anglian’s oldest Douglas Fir trees in the heart of Thetford Forest. 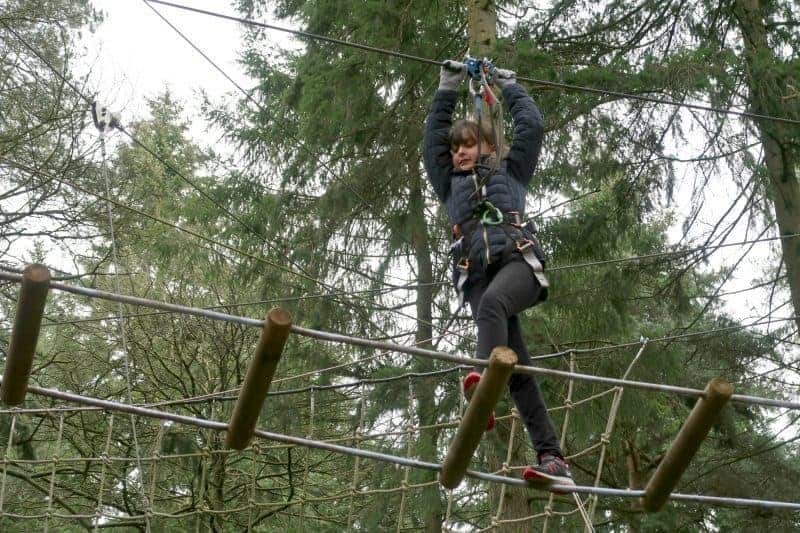 The high ropes course layout leads you on a journey around the site with each section hidden from view by a mass of rhododendrons and native scrub. The adventure starts with the important safety notices, briefing and harness fitting. Whilst participants are eager to get up the ladders and clambering through the treetop course, safety is paramount. With adults required to sign a declaration on behalf of themselves and any children that they will be supervising across the course. 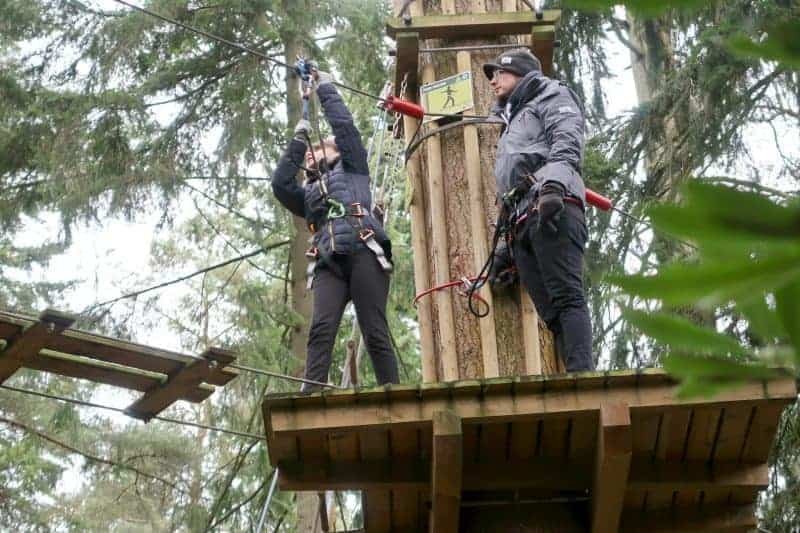 Once the safety briefing was completed it was time to head over to the first of five treetop sites for Mr Boo and Roo to try their hand at. Each one accessed via rope ladders, with the all-important safety lines for them to attach their harness clips to whilst ascending to the platforms. 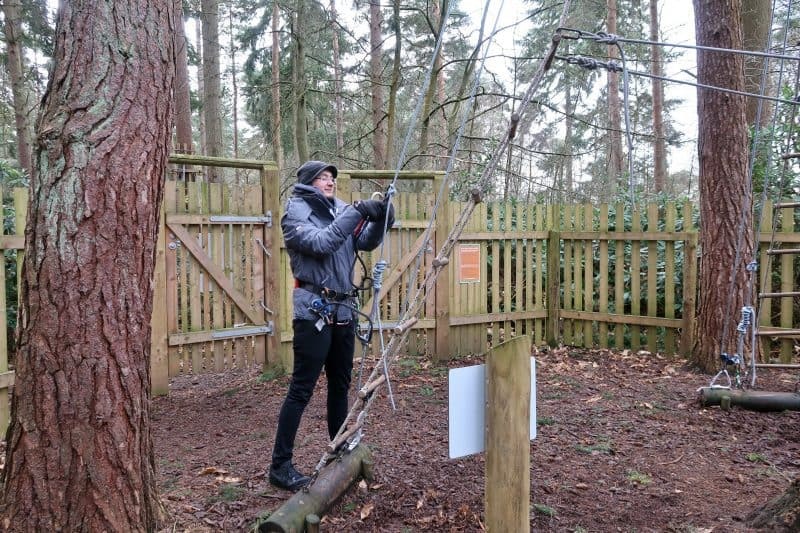 Once on the treetop platform, it was time to make a start at tackling the various ways in which to navigate through the treetop course. With a mixture of wires, stirrups, horizontal ladders and stepping stones to get them from tree to tree. With each section ending with a zip wire, descending them from the treetops down to terra firma. Taking each section in their stride with only one wobble from Roo when it came to crossing the swing log bridge but she managed it. Although it was a little cold (the joy of February in the UK) both Mr Boo and Roo had a great time. I’m sure that they will be back in the summer to complete it again in the warmer weather. Whilst Tigger has declared that he would love to take part in the junior course. I love Go Ape. Hoping to take my eldest to do the bigger course this year, and need to get middle man to finally do the junior one.